An innovation in compact, economical storage space solutions, the Yardsaver fits in and blends in like no other building can. The horizontal paneling looks great "leaning" against any wall or in narrow, hard-to-fit areas. Yardsaver is ideal for storing trash containers, bicycles, lawn equipment, firewood and more. This 4' x 10' shed offers UV resistant steel panels to protect against rot, insects, and extreme weather conditions, and 38 sq./ft of storage. Do I need to buy any additional kits to mount the shed on a plywood floor? Also, how wide is the door opening? You will need to purchase the Arrow Sheds Floor Frame kit to mount the shed on a plywood floor or lay your own foundation. The kit can be found here . The door for this unit measures approximately 38-1/2"W X 60"H.
I really like this shed, but I do have some issues with it, and all of these problems are confined mainly to the confusing and cumbersome assembly process. First of all, never try to assemble this shed if it is a windy day. Second, wear gloves because there are sharp edges on many of the parts. Third, the instructions are poor and require a good deal of guesswork. Fourth, you will need to assemble it and then move it into position up against the wall of an existing structure. Finally, plan on the assembly taking about a day; it is not a two hour project. All of this being said, it is fairly affordable shed that butts up against the wall of a house. Even though my back would differ with me, I am completely satisfied with this product. Beware of the wind and rain when assembling this product, and make sure that it is not in the forecast when you assemble it. Also, be sure to secure it down once the assembly is completed. This aside, it took me twelve hours over two days to complete the assembly process. This shed did take both my son and me a total of twelve hours to complete, but the work was mainly time consuming. It was easy to assemble, but you need to have patience. Even though I feel that the kit is well designed and the planning is thorough, there is some advice that I would like to give to everyone interested in assembling this kit. It is imperative that you square up the floor/assembly platform so that all of the sections can fit to it easily. You need to make sure that you follow all of the assembly instructions in their specified order or else you will find yourself needed to reassemble and reorganize the various parts. I advise that you install all of the trim sections with the aid of a hand held screwdriver. You should plan on it taking eight hours for two people to assemble this kit. This shed is quite spacious and well build overall. We were surprised initially when it arrived in the mail and saw just how many parts it had. The biggest surprise was that it went up quite quickly, and gave us storage space that we are all quite satisfied with possessing. This is a shed that has a very attractive overall appearance and possesses a good deal of indoor space. The instructions were clear and it was really quite straightforward when the time came to assemble. The assembly process of this shed is still a work in progress, and I will give some advice so that people can find an easier way to get the job done. Thankfully, I did not buy the optional floor frame kit, which if I had done so, it probably would have made this process even more complicated. The screws are not well separated and the labeling is not always clear. Additionally, be prepared to cut some pieces that are not made to fit. I'd guess most people buy this shed because they have limited space and want it next to a building. Now that it's done, it's perfect for this. But... The shed is constructed from the outside. And don't expect to move it very far once it's built. But you need to be able to get on all four sides of the shed to put it together. If you're careful, you can move it away from the house enough to get on that side. Unfortunately, I was putting the shed on the side of my house. It has a five-foot setback from the property line, but taking the width of the fence into account, I had 4'8". Consequently I couldn't get to the sides of the shed once the siding was on. And even attaching the siding wasn't trivial. I wouldn't have bought the shed if I had known it was going to be that difficult to put together. ConsNeed enough room to get on all four sides and to get a ladder on the side so you can work on the roof. The size is exactly what I needed, but the roof was not supported very well, it needed angle iron added to it. Even though it did take a good deal of time and effort to get the right parts where they need to go, the overall look of the shed is quite satisfactory. There were some occasions in which the instructions were not clear about which parts needed to be put where, making the installation process a little bit cumbersome. Some of the markings on the shed had faded and the sheer number of screws and washers made it a challenge to assemble even with the assistance of my wife. Overall, the product is a good one that arrived in a timely manner. For starters, it is important that you have three to four days of good weather available, since you will need that amount of time; in addition, poor weather will make it a big challenge to get this shed up, so make sure it is good weather all around. I will add that while I was searching for a shed, I was a little surprised at the prices for sheds on the market, but was pleased to discover that this was the least expensive option out there. During the installation process, I found the need to keep making sure that everything was properly lined up. The platform was built to all of the specified standards. 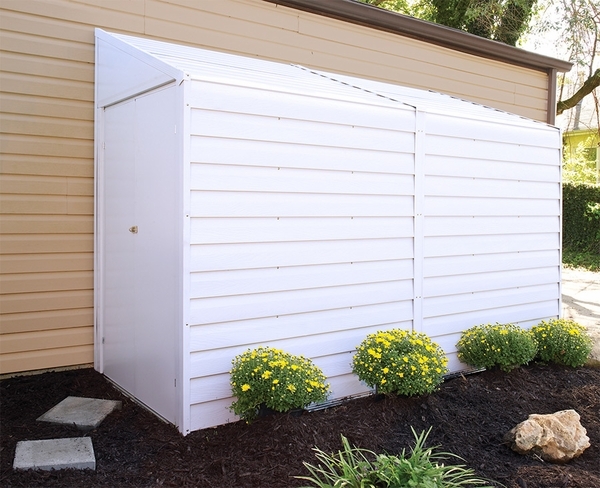 Overall, this shed is great for storing all of your lawn care equipment, and when it comes to appearance, it is almost impossible to beat the overall look of this shed. My one quibble is that the instructions are not the easiest to follow, and sometimes are confusing, particularly with regard to all of the illustrations. Overall, this product gets all pluses. There were not big problems and all of the parts that needed to be assembled were present. The shed sits on a concrete slab, and to date, it does not have any noticeable leaks (I did not use the option floor kit.) I plan to buy another shed and then join it to the original one that is standing on my yard. Even though this is a great buy, there are a few negatives that need to be laid out. It is a little flimsy and installation time did take two full days, but in the greater scheme of things, there are really trifles. The shed is in a low traffic area of the yard, meaning that it most likely will be able to last with minimal wear and tear. The delivery time was great and the product arrived unscathed. Thankfully, it is perfect for the narrow area between our house and fence, and the door installation makes it look very unobtrusive with the rest of our home. It is imperative that you be patient during the process of assembling this shed. If the wind is blowing and you find yourself in an exposed location, then do not attempt to assemble this shed. I would also like to add that it took two relatively experienced workers close to eight hours to assemble this shed in addition to the three hours needed to sort the parts and then build the frames. The directions and drawings were rather difficult to follow, sometimes being woefully inadequate. Because of this, there were occasions that steps needed to be redone. You will know if you have made a mistake because nothing will line up later. One of the hardest parts of the installation was due to the fact that some of the nuts and bolts were stored in a bag that contained 300 screws, making the process of sorting a complex endeavor. Additionally, the installation process requires that you put a washer on a screw, a job that any young helper would have found to be ideal. One issue was that some of the part numbers had rubbed off, making it difficult to identify them. Additionally, some of the metal parts were bent, but thankfully it was easy to straighten them out with a pair of pliers. In short, assembling definitely does take two people. It will be quite flimsy until all of the structural supports are in place. However, once everything is in place, it will become quite sturdy. In order to insure the final steps of assembly go smoothly, be sure to have one person inside to tighten the nuts and bolts. One warning is that the door hinges do seem to be small, meaning that if someone pulled too hard they could easily rip them off, making security a legitimate issue. In the end, the shed does achieve its intended purpose of holding both a dirt bike and a tandem bike. I was kind of expecting it to be white, but in the end, it has a bit of a grayish color. You might be better off in building your own shed. It took two of us a total of six hours to assemble this shed. Even though the instructions called for wearing gloves, it is not possible when you are dealing with 7/16" screws. This shed is not for amateurs, and the flooring was really quite poor. Even though this is a shed that I like on the whole, it does come with a handful of problems that do need to be addressed properly prior to installation. First off, only assemble this if there is no wind outside. The materials used in this sheds fabrication are quite light and any type of a breeze will pose a major challenge (mine was blown over before it was secured to the ground.) It is a must that you have at least another person helping you in the assembly process; sometimes, having a third person is nice. Part of the reason for this aid is that there are quite a few parts that need to be held in place prior to assembly. No specialization is required to assemble this product. The one issue that does make it a bit of a nuisance to assemble is that while it is designed to be set up against a wall, you cannot assemble it against the wall. On the whole, the materials were quite good and I really did like all of the additional screws that came. I'd rate this product as an item that possesses a very good design. There were, however, a few times during the assembly process that I did need to do some guessing about things. We chose this product after doing a lot of research on the various options available. We did not have nearly as much difficulty assembling the shed as others have mentioned in their reviews. My husband was able to complete it in about 15 hours, using my help a few times to hold pieces in place. He found the instructions simple to follow, but he did acknowledge that it might be a little more difficult if this was a first building project. We would recommend separating the various screws and hardware pieces prior to beginning the actual construction. All these items are contained in one bag and can be a bit difficult to sort out as you go along. The quality of the finished product is quite good for a shed of this nature. The white exterior color actually has a bit of a gray tint to it, which may be noticeable if the shed is placed close to a stark white building. The anchoring kit is a good investment if you would like to make the construction a bit sturdier. 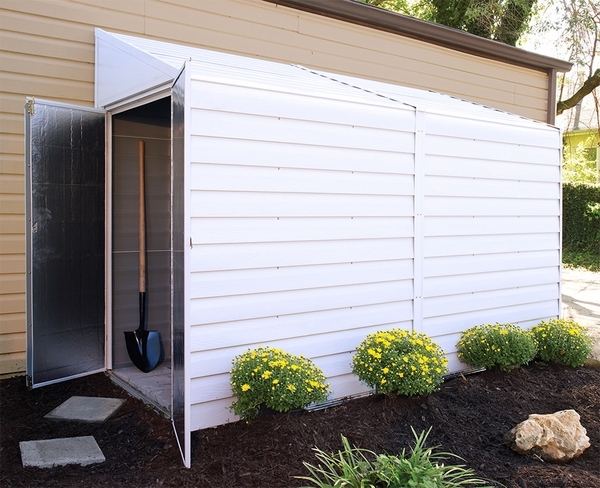 This shed is a good choice for an inexpensive building to store yard tools and supplies.